You do not need to be holding a nautical event to book a Pirate, as we are currently en vogue with films like "Pirates of the Carribean" or "Pirates in an adventure with scientists". Scurvy performs juggling (cannon balls, clubs, knives, axe, baseball bat and fire), magic (close-up and stage), whip cracking, balloon modeling, uni-cycling and other associated skills. Yes, I know, balloons and unicycle are not piraty but it's fun. If you are having a re-enactment day then I can leave them on “Carrie”. Carrie is Scurvy's own boat, a 23 foot gaff cutter, Falmouth working boat, so he knows his foresheet from his jib. How can Scurvy enhance your event. The media love to photograph the entertainer with local kids. Scurvy has the experience to help the photographer get the right shot. Show: If you have an arena or stage area then Scurvy can perform a 45 min show of juggling and magic. The show can either be a kids' show (knives, etc. ), loads of Arrrrrrrhs!! and other pirate games. Or you can have a family show (similar to an Edinburgh street show) with danger! juggling knives, axe, base ball bat while balancing on a roller-bowler, the walk of death (juggling knives over two volunteers), whip cracking. The show can be adjusted to suit your requirements so drop me a line or phone to let me know what you want. Walk-a-bout, Mix and Mingle: Walk-a-bout or mix and mingle is as it says on the tin. 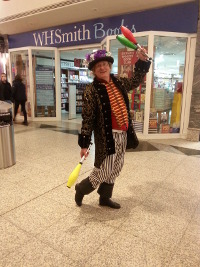 Scurvy carries pocket magic and juggling props around, and interacts with the crowds of people. The props may be small but the reaction is very big. Scurvy or Graham as he is sometimes known has performed close-up magic and juggling in top hotels, gala days, shopping centres and loads of other venues as well.